We are aware of issues which have resulted in website and email interruptions for some of our customers. These problems were caused by a hardware failure on one of our hosting nodes and we have been working hard to resolve this as quickly as possible. If you are currently experiencing any problems with website or email hosting services which we provide to you then please get in touch to report it. We build websites that are easy to navigate, commercially successful and appear at the top of search engine listings. Our websites are much more than just online brochures, they are at the cutting edge of functional web design. Every web design project is unique, just like our customers, which is why we begin every project with a clarification of a customer’s real needs and objectives. From here we are able to produce relevant, artistic, market leading, and technically efficient communications delivering real business benefits. Our business focused approach has ensured a high level of satisfaction from our clients. 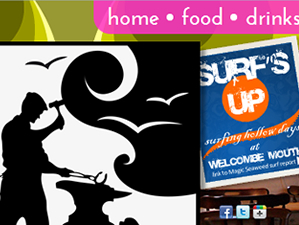 Based in North Cornwall, we produce websites for clients all over Cornwall, the South West of England and far beyond. To find out more why not see what our customers say about us, view some of our most recent designs. If you have a project in mind, don’t hesitate to contact us.